Homages in the arts can be tricky undertakings. When a musical act, author, filmmaker, etc., produces a work that is largely derivative of a previous creative effort from the same medium, how should critics and the general public view their output? Should it be taken at face value, experienced and judged only as to whether or not it is an effective work in its own right? Or should it always be compared to the piece off of which it is riffing? In terms of artistic prestige, will it have to hold a permanent status as being some number of rungs lower than similar titles that are more purely original? When up-and-coming film director Brian De Palma and rising star screenwriter Paul Schrader conceived and executed what became the 1976 movie Obsession, they very deliberately pulled concepts and atmosphere from Alfred Hitchcock’s much-beloved Vertigo (1958). When they wrote the story together and Schrader went on to convert it into a screenplay, they were thinking of drawing on other influences, including the 1962 Japanese film An Autumn Afternoon. But it was clearly Vertigo that was the biggest reference point in their collaboration. Read any critical analysis of Obsession—whether it was written around the time of the film’s release or since—and you’ll likely encounter a mention of Hitchcock’s classic within the first few sentences. Shout! Factory’s new release of a collector’s edition BluRay version of Obsession gives anyone interested a reason to see the film and assess its value, whether in comparison to Vertigo or in and of itself. 1976 was a breakthrough time for both De Palma and Schrader, who turned 36 and 30, respectively, during the year. De Palma, who’d previously directed cult favorites such as 1972’s Sisters and 1974’s Phantom of the Paradise, saw his adaptation of Stephen King’s horror novel Carrie hit theaters just a few months after Obsession made its debut. His career was solidified with these efforts, along with future releases Dressed to Kill (1980), Blow Out (1981), and Scarface (1983). Schrader, meanwhile, was just getting started in films at the time. But what a beginning! His second and third screenwriter credits, both for films that came out in ’76, were for Obsession and, um, Taxi Driver. 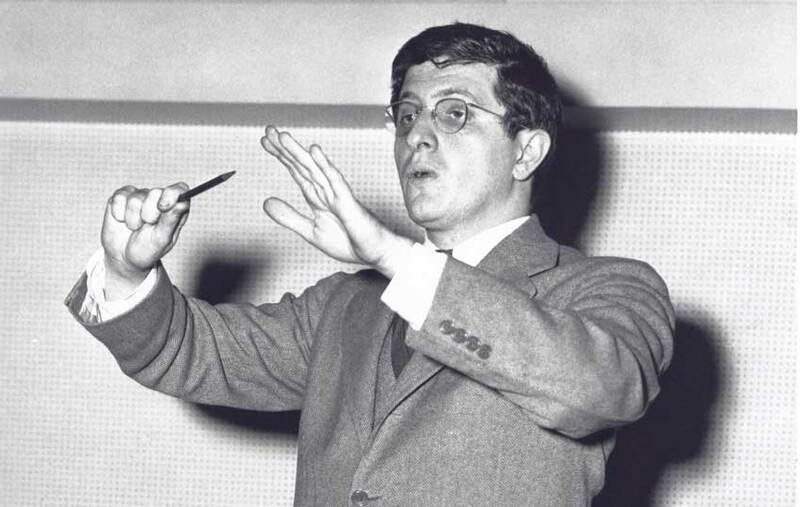 Another key player in the development of Obsession was composer Bernard Herrmann, who provided the score. Herrmann was the perfect choice for De Palma and Schrader because the esteemed veteran did the score for Vertigo, among other Hitchcock titles. But while Obsession was an early career effort for De Palma and Schrader, it was—along with his musical work on the aforementioned Taxi Driver—Herrmann’s swan song. The composer died late in 1975, at age 64, having completed his parts for both films but before either was released to the public. It’s said that Herrmann treasured Obsession. He proved to be a key player in an artistic dispute between De Palma and Schrader over its direction; more on that below. Ok, that’s enough background. Now some comments on the story. But not much about that should be said here since the tale is driven by plot twists that shouldn’t be spoiled for those who haven’t seen the film. 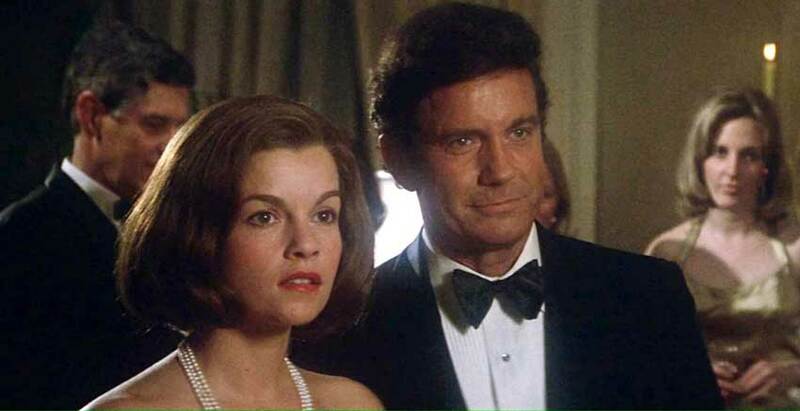 Cliff Robertson (whose performance underwhelmed De Palma) stars as Michael Courtland, a well-off real estate developer from New Orleans. The story opens in 1959 at a party in Courtland’s stately home. All seems to be well in the man’s charmed life. But later that same night, his wife and their young daughter are kidnapped. When the authorities later botch an attempt to trick the abductors during the ransom payoff, tragedy involving the woman and child occurs. We are then taken forward to 1975. We see Courtland, an afflicted man still much damaged over the events involving his family from 16 years earlier, nonetheless doing his best to keep a chin up. He agrees to go on a trip to Italy with his business partner (portrayed by John Lithgow). While in Florence, Courtland has a chance encounter with a young woman who looks so much like his deceased wife (both are played by Geneviéve Bujold), as to be disturbing. Courtland stalks his late spouse’s doppelganger, then befriends her, and then things start getting really weird. Let’s stop there. Anyone familiar with the plot of Vertigo can see the similarities between the two stories. But there are enough differences between the two plots to place Obsession on an artistic level above a blatant rip-off of some other work. De Palma and Schrader drew on the Hitchcock title in creating their own psychological thriller that involves mysterious identities and brain-endangering infatuations, sure. But they delivered their own unique story that has enough originality to have its quality assessed apart from whether or not it matches the artistic high most see in Vertigo. The creative difference alluded to above had to do with a disputed final section of Schrader’s screenplay. This was a development he wanted to add to the end of the story as it is seen in the released film. De Palma was opposed to this final section of the script, and when Herrmann told De Palma that he felt that segment was overkill and that it should be deleted, that was all the director needed to hear. The section was eliminated, angering Schrader to the point where he said he no longer had any interest in the movie. The film was completed by the end of ’75 but didn’t make it into theaters until the summer of ’76 because higher-ups within its distributor, Columbia, had issues with some of the more scandalous aspects of the script and forced De Palma to make some edits. It must have been both thrilling and possibly frustrating for the director that two movies he made were revealed to the public so closely together—Carrie started screening in movie houses in November. 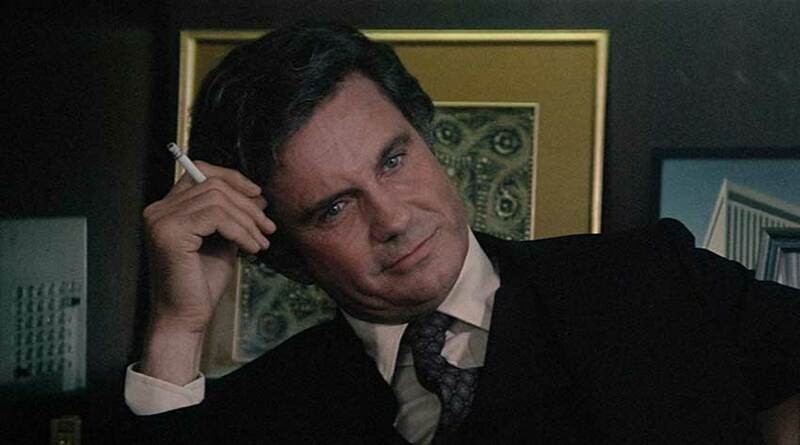 Cliff Robertson as Michael Courtland. It’s true that Robertson comes off as wooden at times in his playing of the stricken Courtland. But the man is meant to be psychologically disturbed, also haunted, so the mentally paralyzed state in which he often seems to be holds true to the story. Bujold, whose acting in the film entranced both De Palma and Herrmann, excels at playing multiple, overlapping characters. And Herrmann’s score, while often bordering on being over-the-top dramatic, ultimately works in using musical sounds to point to the increasingly intense and unexpected developments in the plot. 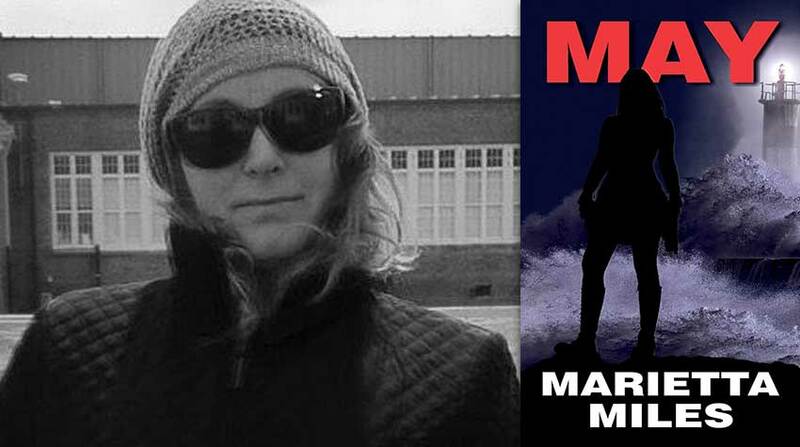 It’s a fascinating thriller, albeit one whose story asks a viewer to make some big leaps in terms of believability. While New York Times critic Walter Goodman ridiculed the film in 1976—saying it lacked credibility and predicting that Hitchcock would publicly roast De Palma for mentioning him as an influence on the film—Roger Ebert championed it as an enjoyably overwrought melodrama. Obsession is not De Palma’s best work; it was more of a stepping stone for him. His run of directorial efforts mentioned above are all more fully realized films. But it’s an effectively twisted story and a pleasurable watch for anyone who likes a good cinematic psychological thriller. It’s must-see fare for anyone interested in De Palma’s full career. The new Shout! Factory edition comes with a generous package of bonus features that will be of interest to anyone who cares about Obsession and/or about De Palma in general.